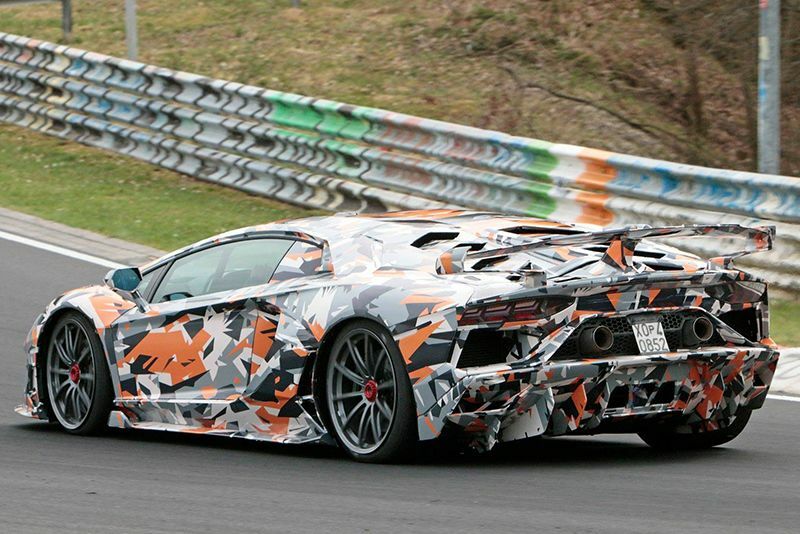 Lamborghini's extreme Aventador Super Veloce Jota has officially clocked a Nurburgring lap record of 6:44,97s. The track-focused production car from Lamborghini knocked two seconds off the lap record set by the Porsche 911 GT2 RS at Germany's esteemed Nurburgring Nordschleife, with the Aventador SVJ recording a 6:44,97s lap. As you can see in the gallery, the Aventador SVJ, or Super Veloce Jota, was still sporting disguised bodywork but, according to Lamborghini, it will be revealed in full soon. The Aventador SVJ has received more than just a nip and tuck compared to the standard Aventador, in fact, the aerodynamics have been completely overhauled with the simple intention of improving performance. If you look past the wrapping, you'll notice a deeper front wing, wider side skirts, a huge wing out back and a high-mounted exhaust, not to mention the really cool motorsport-inspired single centre nuts. What you may not notice is Lamborghini's ALA 2.0 active aerodynamics system. It appears that the Super Veloce Jota also gets larger air intakes to feed more air to Lamborghini's 6.5-litre V12 engine. Lambo's engineers have also, apparently, added titanium intake valves too. Translated, this means that power jumps from the Aventador SV’s 730bhp to around 760bhp at 8,500rpm with 720Nm of torque at 6,750rpm – giving it the best power to weight ratio ever on a Lamborghini at 1.98kg/hp. It has also received chassis and suspension tweaks to help contain this extra power while a purpose designed set of Pirelli P Zero Corsa tyres get it to the tarmac – although optional Pirelli P Zero Trofeo Rs were used for the blistering Nurburgring record. As a little tidbit of info for those who don't know, the word 'Jota' in Super Veloce Jota has previously been the reserve of Lamborghini’s most aggressive and exclusive vehicles. So exclusive, in fact, that only two models have previously worn the badge – the Miura and Diablo. Welcome to the family, Aventador, wear the badge proudly. Video: Watch Subaru's Nurburgring Record Lap!